February 2019 – Make a nomination by February 28, 2019 to help name the education wing! See more information and form below. A change is coming to north Champaign and we’d like you to be a part of it! The Champaign Park District’s Martens Center will be opening in 2021 and will be providing life changing opportunities where people can meet, play, and learn all under one roof. This state-of-the art, multipurpose community center will bring a variety of community organizations together to provide programs where people can learn new languages, how to prepare nutritious meals, open a business or obtain job skills. Tutoring and afterschool programs for youth will be offered along with physical fitness and arts programs for people of all ages. This and so much more for people of all ages! The new Martens Center is being funded through private donations, grants and a variety of community partnerships. There are many naming opportunities available to recognize those donations, including two education wings of the center that will house the majority of the programs. An anonymous donor has stepped forward and requested the naming of one of the education wings be in honor of an African American educator who has made a significant impact on our community. So we’d like your input! Please follow the link below and give us the name of one area African American educator who you think has made a significant impact on our community, then provide a brief explanation for your choice. Names will be taken until February 28 then provided to the donor for their selection. October 2018 – We held an event to shine a light to the upcoming Martens Center. See photos below! 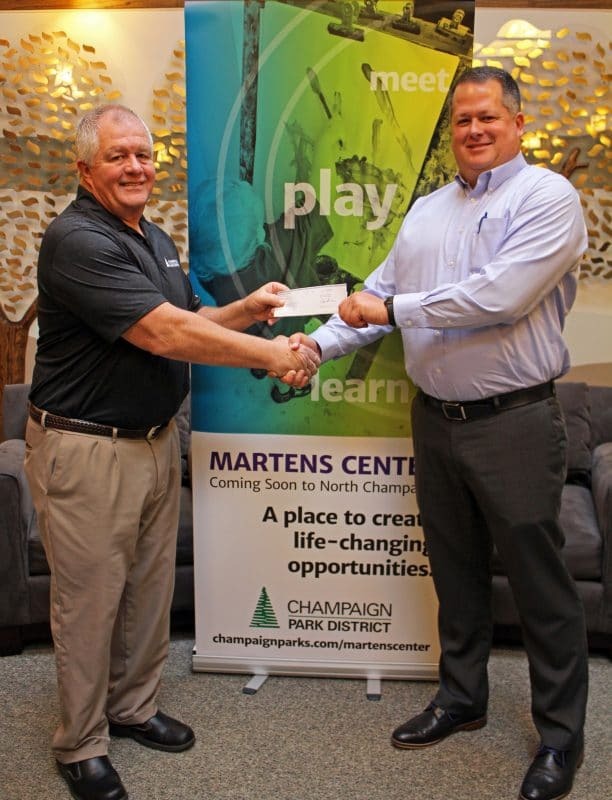 David Farrar, Senior Manager, Field Services & Production of Illinois American Water, Eastern Division presents a check for $50,000 to Joe DeLuce, Champaign Park District Executive Director in support of the Martens Center.